Regular readers of gentrymagic.com will have noticed I haven’t had much time to write about or even just play Gentry these past few months. Busier times at work, a steady relationship and weekly testing sessions with the Wrecking Ball crew all taking priority have largely pushed Gentry off my itinerary. I still love the format, however, and I was looking forward to playing the Open, the pinnacle event of each Gentry season, which I had always enjoyed immensely in the past. Unfortunately, it turned out that I was double-booked, as I had already committed to a barbecue and quiz my girlfriend was organizing. With the barbecue starting at 18.00, there was no way I would be able to play in a potential Top 8, and if I couldn’t make the prizes, there didn’t seem to be much use in paying the €15 entry fee. That was my original reasoning, and I believe most competitive Magic: the Gathering players I know would come to similar conclusions. I also think this reasoning is flawed, at least in certain cases. Many decisions people make on a daily basis come with a cost-benefit analysis. For the majority of competitive Magic players, expected monetary value and the chance to take home the title are the primary factors in deciding whether or not to play in a tournament. This is why tournaments with an above average prize pay-out (like the Gentry open, in fact) draw more players than tournaments with less attractive prize structures, why prestigious tournaments have higher attendance on average, and why competitive players are increasingly upset with the exponential rise of GP entry fees in recent years. As a general rule, you register for a tournament only when you expect a reasonable return on your initial investment. With no shot at the title, and only a very slim chance at securing prizes, then, there seemed to be little to no reason for me to play in the tournament. What is often overlooked, however, is that monetary value is only part of the equation. For the more casual player, for instance, the expected value of a Magic tournament lies elsewhere: they play to have fun, to improve, or to enjoy an afternoon among friends, much more so than to win the tournament or to come away with a few booster packs. There’s a lesson to be learnt here. If you play in tournaments with the sole purpose to win, you’ll be disappointed whenever you don’t, and that’s prone to happen on the regular, no matter how great of a player you are. Magic is, after all, a game of chance as well as a game of skill. To reserve part of your expected value to the element of fun, rather than focus on nothing but money or winning, then, can only serve to enhance your tournament experience. Basically, you’re hedging your bets. It came to me that the Gentry Open would be my final opportunity to play some of my favorite cards from the Shadows over Innistrad and Battle for Zendikar blocks, and that I valued that opportunity way more than the boosters I could potentially win. Then and there, I decided that this time, I’d focus on having fun, rather than competitive edge. What constitutes having fun playing Magic will differ wildly depending on who you ask. Some love beating down with small creatures. Others enjoy locking their opponents out of the game while slowly torturing them to death. Still others prefer “going off”, winning the game through alternative means such as milling or infinite life or damage combo’s. There are literally hundreds of ways to enjoy Magic. It’s one of the things that make it such a great game. Myself, I have the most fun playing Magic when I’m designing slightly off-beat decks that durdle around with value spells and recursion until the opponent scoops in disgust at the value discrepancy. It’s no wonder that my favorite cards include efficient creatures with enter the battlefield triggers (Snapcaster Mage! Eternal Witness! Mnemonic Wall!) and tutor effects, as well as artifacts and enchantments which slowly accrue incremental advantage. Cue the deck I proceeded to work on for the Gentry Open: Sultai Seasons Past. This is the deck’s core. Seasons Past has long been a pet card of mine, but I hadn’t gotten to play it in Gentry yet, so I set to the task to make it shine one last time before it rotates out. 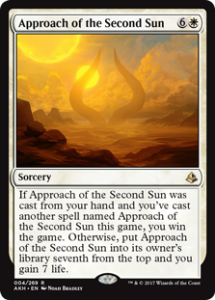 In a properly built deck, Seasons Past is an incredible draw spell, often drawing between 4 and 6 spells as well as a land. Razaketh’s Rite is the ideal complement, as it finds the Seasons Past when you need it (and can be cycled when you don’t), before Seasons Past returns it to hand alongside a slew of other spells, ready for you to go look for the powerful sorcery again. Rinse and repeat. This value loop will eventually overpower any deck in the late game, provided you can consistently pull it off. The rest of the deck, then, is designed to maximally support the main engine. Five and six mana sorceries that don’t affect the board when you play them don’t just work in any deck. For this plan to come to fruition, you need to be able to afford to take those turns off to set up your powerful endgame. The best deck to take advantage of a late game engine such as Seasons Past, then, is a heavy control deck. 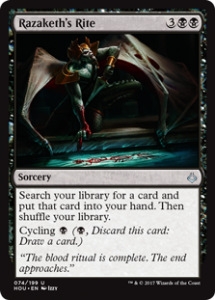 That means removal, counterspells, discard and card draw. 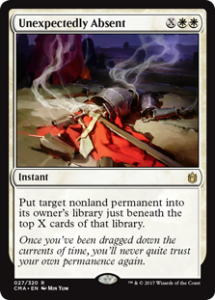 I believe you want at least 5 early removal spells and up to 6 or 7 post-board, as the easiest way to lose with such a slow deck is to get outgunned in the early game. One mana removal such as Fatal Push (excellent) and Dead Weight (the best alternative at common) really helps here. Murder is the necessary catch-all, which can also be Brought to Light. Grasp of Darkness was a late addition, replacing a third Fatal Push. I was worried I wouldn’t be able to deal with 2+ mana threats with 3 or more toughness, as it wasn’t going to be easy for this deck to trigger revolt. In addition, at two mana, Grasp helps diversity your targets for Seasons Past in the late game. When building a deck, it is important to identify the deck’s weaknesses, and to try and shore them up wherever possible. Any deck aiming to cast big sorceries is dead in the water to decks with multiple counterspells, which is why I attributed several uncommon slots to discard spells. In theory, these should help clear the way for the deck’s engine cards. Diversifying the discard spells again allows for more options with regards to Bring to Light and Seasons Past, while Doomfall provides outs to hexproof creatures and powerful recursive rares like the different Gods or Sphinx of the Final Word, which I expected out of the control decks and are hard to deal with otherwise. Essence Scatter is an excellent answer to both the different Gods and whatever value creatures your opponents might throw at you. I didn’t want more than one maindeck Negate, but the power of planeswalkers in the format and the utility across the board makes it a good one-of. Countervailing Winds had impressed me in limited, and continued to do so throughout this tournament. It often “Censors” something in the early game, and cycles when it doesn’t, and when you draw or return it in the late game, it’s basically a catch-all hard counter. I think the card is underrated. In retrospect, I think this should have been a 1-4 split, as Illumination is just the better and more flexible card. I wanted an instant-speed card draw spell in the three mana slot in case I didn’t have to counter anything or got stuck on three lands, but one would have been enough. 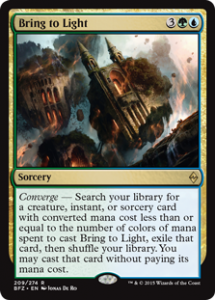 I’ve played Bring to Light in so many decks now, I’ve officially lost count. It’s easily one of my favorite cards in all of Magic. The set-up cost can be high, but there is a lot of value to be gained from finding specific answers in specific match-ups. I’ve been a sucker for toolbox decks throughout my entire Magic career (Nate Weiss’s Mafia King deck is still one of my favorite concoctions of all time – look it up), and that isn’t going to change anytime soon. Flaying Tendrils provides an answer to token decks, while Pulse of Murasa can be backbreaking against the burn/Themo-Alchemist decks. 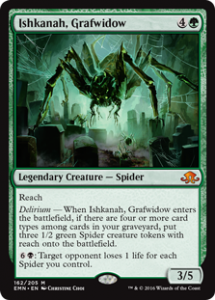 Dissenter’s Deliverance cycles, which makes it a low-cost include that can help with difficult-to-handle things like Renegade Freighter, Oketra’s Monument or the God-Pharaoh’s Gift deck. Keep in mind that you will be able to return these silver bullets with Seasons Past in the late game, making them all the more powerful. 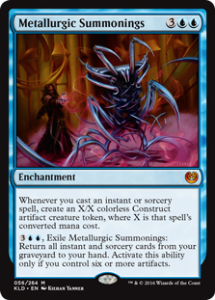 Metallurgic Summonings is another card I had been wanting to try out in Gentry, and, like Rise from the Tides, it seemed like a natural fit in 25+ spells deck. It even combines well with Bring to Light, which allows you to cast several spells all at once. Once you have Summonings in play, resolving a Seasons Past is basically game over. Sphinx of the Final Word was a late find, but an essential one. I expected many of the experienced players to be on pure control decks (UW, UR, UB) or on blue midrange decks (Temur Energy, Jeskai Value, Grixis Cycling, UW Monument), and I didn’t fancy my chances against those, especially after sideboard, when they can usually bring in 4 Negates and up to 4 Dispels, which would make resolving Season’s Past a liability. This is where the Sphinx comes in. It is an extremely powerful card in these matchups all on its own, as I wasn’t expecting many people to be packing Doomfalls, and Blessed Alliance is easy to play around, especially once you’ve sided in counterspells of your own. 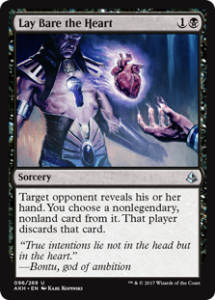 In addition, I was expecting the good players to allow me to resolve my Razaketh’s Rite, as an ancient rule of Magic says that you should usually counter the tutor target over the tutor itself, since that requires your opponent to spend more time and resources. If my opponents indeed reasoned this way, my first tutor could now get the Sphinx, which would then render their counterspells obsolete and allow me to resolve my other spells unimpeded. 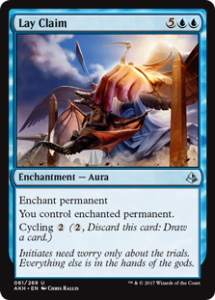 Lay Claim functions as removal for planeswalkers and other problematic permanents, while also doubling as a win-condition. You can often cycle it early and later bring it back later with Seasons Past, which negates its high manacost. The sideboard has several usual suspects, like Negates and Dispels to replace the dead removal spells against control decks. I decided on a 3-3 split across the 75, instead of the perhaps more conventional 4-2 split, because I expected Dispel to be essential in resolving my big sorceries. Natural State and Appetite for the Unnatural provide artifact and enchantment removal at different spots in the curve, while a second Pulse can come in against the red decks with a lot of burn. 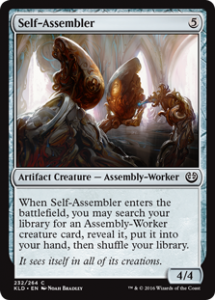 The Self-Assemblers are a very strong sideboard card against control and removal-heavy midrange in general, but they are especially potent coming from the sideboard of an essentially creatureless deck. 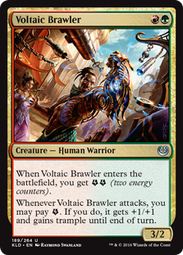 Your opponents usually side out removal, leaving them without answer to your Assembler Train. With all the counters, removal and discard, as well as Lay Claim and Doomfall, I felt confident that Ramp would be a good match-up. After a deck check and the complementary time extension, we played a very long Game 1, which I won comfortably, though it took me a long time to close out the game. Game 2 looked to be going the same way, but I somehow managed to draw almost every land in my deck and eventually succumbed to creatures off the top. With little time left in the round, we played Game 3 at a very high pace, and after I tutored up Flaying Tendrils to deal with 4 of his mana creatures in play, I felt like the game was mostly won. I had 7 lands in play, with several removal spells and a Lay Claim in hand while my opponent was topdecking, but I was weary of stealing their Crocodile of the Crossing and proceeding to lose to a topdecked hexproof creature with Essence Scatter in hand, so I proceeded to play draw-go as fast as I could in order to play Lay Claim with counter back-up. When he played an Outland Boar with two cards in hand to my 5 (including 3 Essence Scatter and a Countervailing Winds with 10+ cards in the graveyard), I hesitated for a second. If I waited to find a tenth land, I could play Lay Claim with Countervailing Winds back-up, which basically locked the game, but I knew time was about to be called, so I decided to go for the Lay Claim on the Boar with just Essence Scatter as back-up. Turned out my opponent was holding an Appetite for the Unnatural for the Lay Claim and a Samut, the Tested to provide double strike to the reclaimed Boar, which combined to finish me during the extra turns of the game. It seems likely that I would have won the game given more time and patience, but that was a risk I had to take, as evidenced by my opponent winning on the final turns in extra time. Even though I lost the match, the deck felt very powerful, my opponent was pleasant, and the games were interesting, so I jotted this one down as a win in the “fun” column. Round 2, I was paired against Jeffrey, a Gentry regular. We exchanged pleasantries while shuffling up and proceeded to get a long and frankly strange Game 1 under way. He played a Thraben Inspector on turn one, and not having played Gentry for a long time, I put him on UW Monument, which made me hesitant to tap out, as I didn’t want him to resolve said Monument. We then played draw-go for about a million turns while his Thraben Inspector was chipping away, until I finally resolved a discard spell to see what he was up to. I was surprised to see he was actually playing UW Control (I shouldn’t have been, all white versions of control play Thraben Inspector in Gentry) and took a Gideon’s Reproach from his lackluster hand. He was flooding out badly, but I had a metric ton of dead removal spells in hand, so I wasn’t actually doing that much better. He then found a Rise from the Tides for five and another Thraben Inspector, and since I was already at a low life total, I decided to just chuck all my removal spells at the Zombies to give myself as much time as possible to draw out of the sticky situation. I found Metallurgic Summonings off the top and was hoping to follow that up with a draw spell to stabilize the board, but I found a Grasp of Darkness instead, which did buy me another turn, but couldn’t save me in the end. 0-1 after another incredibly long game. I boarded out all of my removal and stocked up on counterspells and Self-Assemblers for Game 2. I actually think I played this game very well, sticking threats when Jeffrey tapped out and trading counters in favorable spots. When he triomphantly played Sphinx of the Final Word, I responded with a Rise from the Tides for five, which put him in the awkward position of having to Fumigate away the board. This then allowed me to play another Self-Assembler, providing some more card advantage. Just when it seemed I had the game in the bag, he topdecked Rise from the Tides for no less than ten Zombies, and I looked to be in a bad spot once more. I responded with my final two Self-Assemblers to prevent any good attacks, and when I found and cast Seasons Past, the game shifted back in my favor for good. It was a thoroughly enjoyable game, but it again took tons of time off the clock. While shuffling up for Game 3, the judge came up to us to inform us that time was called in the round. When Jeffrey went to sign the match slip, I told him to write down 2-1 in his favor, as I had no chance of making Top 8 with a 0-1-1 record and no time to play the final round, while he might still have a chance at 1-1. 0-2 down in wins, 2-0 up in “fun”. At 0-2, I was perhaps expecting to face some odd brew, but my opponent turned out to be playing UR Burn, and played the deck well. Unfortunately for him, my hand in Game 1 was set up perfectly to deal with his, as I drew several removal spells into Seasons Past to put the game out of reach. Game 2 was yet another noteworthy one. Having played draw-go for several turns, I was at 17 when I tapped out to play Sphinx of the Final Word to answer his Chandra, Torch of Defiance. 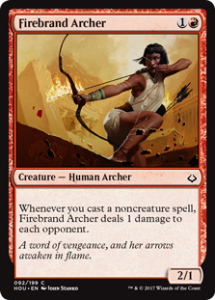 My opponent untapped, hesitated and then said “I think you’re dead”, before adding a second Firebrand Archer to the board, flinging three Incendiary Flows at my head and finishing me off with an Unsummon on one of the Archers to trigger both for the final two points of damage. That was… unexpected. And pretty cool too! Good. Game. In Game 3, it looked like I had the upper hand as I stabilized at 6 life with a Metallurgic Summonings on the board and a 3/3 Construct in play. His topdecked Glorybringer put me in a tough spot however, as he correctly didn’t exert to put me on a two turn clock, and put me dead to tons of possible topdecks. It was now my turn to topdeck, though, as I found a Bring to Light. After some consideration, I took the most defensive line, finding a Pulse of Murasa to recur my Sphinx which had died previously. This resulted in me being at 8 life with a hexproof blocker in play and an extra 5/5 and 3/3 on the board, which was more than enough to take the game and the match over the course of the next two turns. Round 4 found me paired against Alan Schuer, and anyone who has seen Alan play Gentry in the past year will know what that means: GR Energy with plenty of combat tricks. Alan has been piloting the deck for what seems like forever, and definitely knows how to play it. My best plan in this match-up is to hope to answer his creatures early so he would be left stranded with several combat tricks in hand in the late-game. This was exactly how things played out. Unfortunately, though, I never quite managed to run him out of creatures. I couldn’t Doomfall his Bristling Hydra in Game 1 because he found sacrificial fodder turn after turn until I was dead. A similar thing happened in Game 3, which I again lost to the Hydra. To be honest, the only way I won Game 2 is because Alan slipped up, using his Blossoming Defense to prevent his Glorybringer from being Dead Weighted instead of saving it to make sure he could punch through lethal the next turn. A clear loss, then, if ever I saw one. At 1-3, I checked “Drop?” and went to go watch my Team Wrecking Ball teammates, who were all still in contention. Bob secured his place in the Top 8 by piloting a Grixis list I shipped him past Lars Meeuwsen’s very interesting-looking UG Ramp build, while Sander apparently got manascrewed out of two games to lose his win-and-in for Top 8. This is where my eye-witness report comes to an end, but from what I heard, Bob made the semi’s and Aron eventually took down the tournament with Jelle Gyselinck’s Jeskai Value deck. Congratulations to the new Gentry Open champ! Myself, I learnt that sometimes, it pays off to just play a tournament for fun. The deck was tons of fun to play, and it saddens me that the upcoming rotation will leave it dead. Delirium and other graveyard shenanigans, you will sorely be missed.